On Saturday, Review ran an excerpt from Amy Chua’s new book “Battle Hymn of the Tiger Mother.” The article, titled “Why Chinese Mothers Are Superior,” attracted a lot of attention, generating more than 4,000 comments on wsj.com and around 100,000 comments on Facebook. Below, Ms. Chua answers questions from Journal readers who wrote in to the Ideas Market blog. 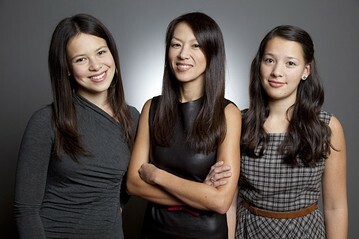 Amy Chua with her daughters, Sophia and Louisa. Do you think that strict, “Eastern” parenting eventually helps children lead happy lives as adults? When it works well, absolutely! And by working well, I mean when high expectations are coupled with love, understanding and parental involvement. This is the gift my parents gave me, and what I hope I’m giving my daughters. I’ve also taught law students of all backgrounds for 17 years, and I’ve met countless students raised the “tough immigrant” way (by parents from Pakistan, India, Nigeria, Korea, Jamaica, Haiti, Iran, Ireland, etc.) who are thriving, independent, bold, creative, hilarious and, at least to my eyes, as happy as anyone. But I also know of people raised with “tough love” who are not happy and who resent their parents. There is no easy formula for parenting, no right approach (I don’t believe, by the way, that Chinese parenting is superior—a splashy headline, but I didn’t choose it). The best rule of thumb I can think of is that love, compassion and knowing your child have to come first, whatever culture you’re from. It doesn’t come through in the excerpt, but my actual book is not a how-to guide; it’s a memoir, the story of our family’s journey in two cultures, and my own eventual transformation as a mother. Much of the book is about my decision to retreat from the strict “Chinese” approach, after my younger daughter rebelled at 13. I have a 20-month-old, and my husband and I both enjoyed the article. How can you apply this to toddlers? Your method may work with children with a native high IQ—but demanding that kind of excellence from less intelligent children seems unfair and a fool’s errand. Demanding hard work and a great effort from children is the best middle ground we can reach philosophically, isn’t it? Your thoughts? Jokes about A+s and gold medals aside (much of my book is tongue-in-cheek, making fun of myself), I don’t believe that grades or achievement is ultimately what Chinese parenting (at least as I practice it) is really about. I think it’s about helping your children be the best they can be—which is usually better than they think! It’s about believing in your child more than anyone else—even more than they believe in themselves. And this principle can be applied to any child, of any level of ability. My youngest sister, Cindy, has Down syndrome, and I remember my mother spending hours and hours with her, teaching her to tie her shoelaces on her own, drilling multiplication tables with Cindy, practicing piano every day with her. No one expected Cindy to get a PhD! But my mom wanted her to be the best she could be, within her limits. Today, my sister works at Wal-Mart, has a boyfriend and still plays piano—one of her favorite things is performing for her friends. She and my mom have a wonderful relationship, and we all love her for who she is. Ms. Chua, are you a happy adult? Do you look back on your childhood and feel that it was happy? Do you remember laughing with your parents? Do you wish that you could have taken ballet or been in the high school musical? And yes, I am a happy adult. I am definitely a Type A personality, always rushing around, trying to do too much, not good at just lying on the beach. But I’m so thankful for everything I have: wonderfully supportive parents and sisters, the best husband in the world, terrific students I love teaching and hanging out with, and above all, my two amazing daughters. What is your relationship with your daughters like now? I have a wonderful relationship with my daughters, which I wouldn’t trade for the world. I certainly made mistakes and have regrets—my book is a kind of coming-of-age book (for the mom! ), and the person at the beginning of the book, whose voice is reflected in the Journal excerpt, is not exactly the same person at the end of book. In a nutshell, I get my comeuppance; much of the book is about my decision to retreat (but only partially) from the strict immigrant model. Having said that, if I had to do it all over, I would do basically the same thing, with some adjustments. I’m not saying it’s for everyone, and I’m not saying it’s a better approach. But I’m very proud of my daughters. It’s not just that they’ve done well in school; they are both kind, generous, independent girls with big personalities. Most important, I feel I’m very close with both of them, knock on wood. Read more on the controversy over Chinese mothers this Saturday in Review.